The Club was formed as Greenan Colts Football Club in September 2012 by Ewen Forsyth & Richard Gillespie. 8 children were present at our first training session at Doonfoot Primary School on a Saturday morning. Since then, the Club grew to around 30 children and moved to Cambusdoon Sports Club in Alloway to accommodate this growth. In 2016, the club changed its name to Cambusdoon Football Club and has grown to over 100 members on the club’s 4th anniversary. We are a fully inclusive club and open to all. 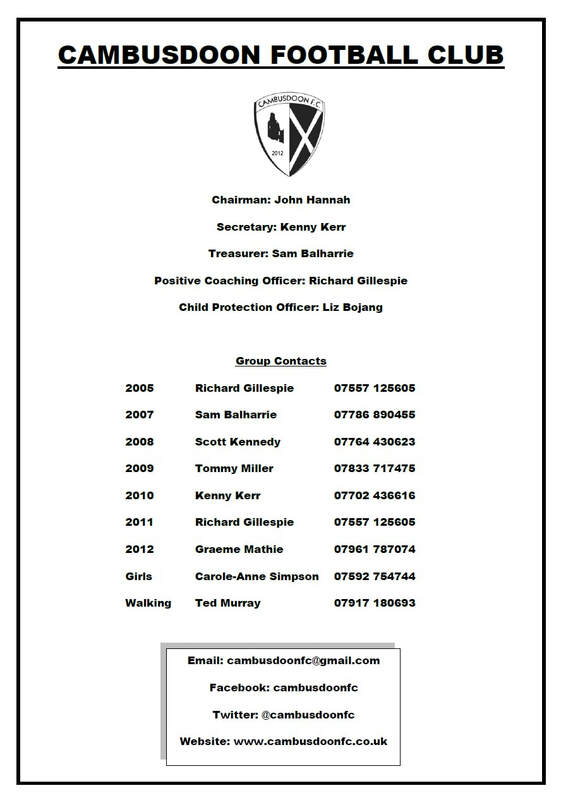 Cambusdoon Football Club is an SFA Quality Mark Standard club and will progress to a Development Club in 2017 and to Community Club in 2018. All our coaches are SFA-qualified and funded through the Club. 4 of our coaches hold SFA Level 3 (Coaching in the Game) qualifications, with a further 5 coaches holding Level 2 (Coaching Young Footballers) and the remaining 3 coaches holding Level 1 (Early Touches) qualifications. We also have 2 qualified Goalkeeping Coaches. 7 of our coaches are First Aid qualified.